We are a leading Manufacturer of chain and rope testing machine, chain testing machine and horizontal chain & rope testing machines from Miraj, India. We supply Chain and Rope Testing Machine which are specifically designed to test chains, rope and any long specimens for proof test or destructive tensile tests. They have a high loading accuracy and an infinitely variable straining speed to suit a wide range of materials. These machines have a continuous roll auto graphic recorder to load- elongation graphs. They have a robust loading frame, have simple controls and easy to operate. It has adequate safely devices for safe operation and enables analogue models with large dials and load measurement by pendulum dynamo meter principle. It's digital/computerized models are also available where load to elongation in digital display and Printout of results can be taken. This product has special accessories like - extra bed length, extra Ram stroke, various special grips, attachments, fixtures as per size and shapes of specimens. 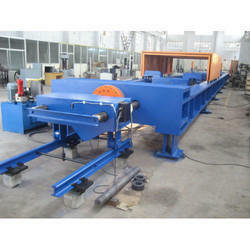 The load-stabilizers can be provided at extra cost to suit special applications. There are various models available in this range with a maximum capacity from 100 KN to 3000 KN. Its loading accuracy is within +- 1%, and conforms to IS:1828/BS:1670 standards. We have streamlined our production process that enables us to expedite our manufacturing process thereby helping us to respond quickly to meet the market requirements. Adding credibility to our company further, we offer products conforming to various Britih and International standards. 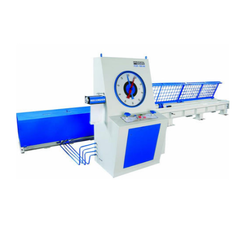 We are instrumental in manufacturing, supplying and exporting a wide assortment of Chain Testing Machine. 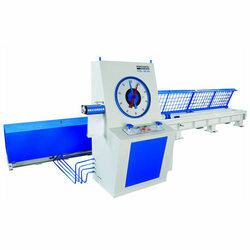 Manufactured in accordance with British and International standards, these testing machines are widely demanded in the market for its efficiency. All these testing machines are designed with digital or computerized models which helps in taking the prints of the required documents and provide digital display. The chain testing machines offered by are developed by pendulum dynamo meter principle. Our chain testing machines finds its application in proof testing of ropes, chains and any other long specimens. Abiding by the ethical norms of the industry, we are engaged in manufacturing, supplying and exporting Horizontal Chain & Rope Testing Machines. Offered testing machines are manufactured under the guidance of our experienced professionals, who strictly follow the norms and standards already laid by the industry. To manufacture these testing machines, our professionals utilize advanced tools and high grade material sourced from the authentic vendors of the market. Looking for Chain & Rope Testing Machine ?